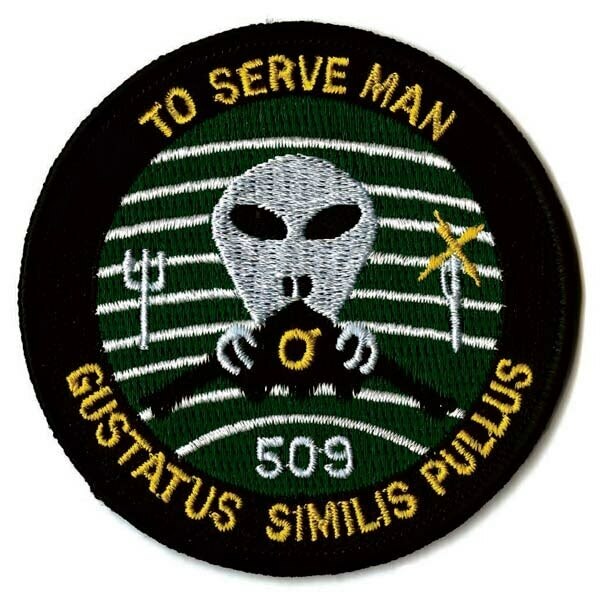 ABOVE: Unofficial 509th Bomb Wing Insignia, Guststus Similis Pullus is dog Latin for “Tastes Like Chicken.” The patches on these pages are from actual operations. In any case, you are free to make up your own mind. One of the more recent patches from the “Ghost Squadron” based at Groom Lake. The design of the skull’s helmet indicates that “Ghost” is a helicopter unit. The footprints on the helmet mark the trace of the “Jolly Green Giant,” a symbol that represents helicopter search and rescue missions. This patch also seems to indicate that “G.H.O.S.T.” is an acronym for the unit. The meaning of the acronym is unclear. A second patch associated with the classified “Desert Prowler” project. Again, the collection of five-plus-one stars may represent the classified operating location at Groom Lake, Nevada, also known as Area 51. The meaning of the other symbols on this patch is unclear. The 6th Joker’s wraith image from the album cover was used on a flight test patch for the Lockheed Skunk Works’ Black Ops Desert Prowler program. It features the wraith with added red eyes, surrounded by six stars with the words “Desert Prowler, Alone and on the Prowl.” The symbol of The Wraith is said to have originated with the The Wraith: Shangri-La, an album by Insane Clown Posse. The Wraith, which represents the sixth Joker’s Card, is in essence the grim reaper, or death. According to the group’s mythology, upon your death, the Wraith takes you to either Shangri-La (heaven) or to Hell’s Pit (hell). In The Wraith: Shangri-La, the ICP guides the listener as The Dark Wraith takes the listener upon an exhibition of heaven (while he may change his mind and try to pull you out of heaven), whereas in the group’s ninth studio album, Hell’s Pit, The Pure Wraith takes the listener on a voyage through hell. On the left of the wizard is the now familiar collection of stars 5 + 1 indicating the unit’s operating location Area 51. Note the shape of the handle on the sword. Based at the Air Force’s secret base near Groom Lake, Nevada, the Special Projects Flight Test Squadron is the Air Force’s only “black” flight test squadron for classified prototype aircraft and advanced concept technology demonstrators. The squadron’s mascot is a wizard. A collection of six stars (5 + 1) on the patch references the unit’s operating location: the secret base known as Area 51. The lowercase Greek sigma symbol in the wizard’s right hand is the engineering symbol for the unknown value of an object’s radar cross section (RCS). The ideal radar signature of a stealth aircraft is zero. While no stealth aircraft has yet achieved this goal, several have come close. On the right side of the patch, the falling globe references the hollow aluminum spheres dropped from the sky to calibrate radar equipment. A sphere of a given size has a known RCS value. Lightning bolts, such as the one emanating from the wizard’s staff, seem to refer to electronic warfare. The aircraft in the lower right is probably a generic symbol representing flight testing of advanced aircraft. The sword at the bottom of the; image refers to a recently declassified Boeing stealth demonstrator known as the “Bird of Prey”: the handle on the sword approximates the shape of the aircraft. Boeing unveiled its $67 million subsonic stealth technology demonstrator design designated “Bird of Prey” part of a project conducted between 1992 and 1999. Also based at Groom Lake, the Special Projects Flight Test Squadron is the Air Force’s premier “black” squadron for testing classified prototype aircraft. The squadron’s mascot is a wizard. A collection of six stars (five plus one) on the patch is a reference to the unit’s operating location: the secret base known as Area 51. The sigma symbol in the wizard’s right hand is a reference to the ideal radar signature of a stealth aircraft: zero. On the right side of the patch, the falling globe references aluminum balls dropped from the sky to calibrate radar equipment. Lightning bolts, such as the one emanating from the wizard’s staff, often refer to electronic warfare. The aircraft in the lower right is probably a generic symbol representing flight testing. The sword at the bottom of the image refers to a recently declassified Boeing stealth demonstrator known as the “Bird of Prey”: the handle on the sword approximates the shape of this prototype. Here again we see the grouping of 5 + 1 stars with a smaller grouping of 3 stars which may represent Detatchment 3. On the last [this] patch you showed, I did some research and came up with this. I have read that the 4 white stars may represent that the classified satellite launched into orbit was actually the fourth of its type. Four stars. Four satellites. B-XXVIII = The only thing I could find was that this may refer to a US naval photographic plate showing a total eclipse of the sun. If you look at the patch, there is what appears to be a sun behind the eye on top of the pyramid. 2SLS = I believe this refers to the 2nd Space Launch Squadron. They oversee the conduct of safe, reliable and timely launch operations to support Department of Defense, national and commercial customers. That looks like a Titan IV heavy lift vehicle on the patch, and that is part of the responsibility of the 2SLS. The B-XXVIII on the patch is no mystery. The launch vehicle was a Titan 4B, number 28 (usually denoted simply as B-28). I went to Vandenberg for that launch but it got scrubbed so the next day I watched it from Edwards AFB. This commemorative patch for a classified flight test of an F-22 Raptor aircraft at Groom Lake shares many symbols with the Special Projects Flight Test Squadron patch. The mascot here is a raptor wearing the clothes of a wizard (like those on the Special Projects Flight Test Squadron patch). The Greek letter sigma hangs from the figure’s neck. The collection of six stars, again, is a reference to Area 51. The phrase “IdB” may reference the intended or actual radar cross section measurement of the aircraft. The words JUST PASSING THROUGH reference the fact that, for this test, the airplane had only to fly through the RCS measurement range while engineers collected data from monitoring stations on the ground. This patch is worn by people working for a unit descended from the 413th Flight Test Squadron. Elements of the former 413th FLTS became a part of the EW Directorate known by its organization code EWAH. Located at North Base at Edwards, EWAH has its own commanding officer who reports directly to the EW Directorate. The collection of 5+1 stars recalls the nickname Area 51, the Air Force’s classified “operating location” at Groom Lake. The Electronic Warfare Directorate is the primary EW test organization at Edwards Air Force Base. Grim Reapers was the nickname of the 4451st Test Squadron, which operated under the 4450th Tactical Group at the Tonopah Test Range during the 1980s. The unit’s mission was to fly a squadron of classified stealth fighters. When the Pentagon announced the existence of the stealth fighter program in the late 1980s, the Grim Reapers were redesignated as the 416th Tactical Fighter Squadron. After the Grim Reapers’ existence became public, the Air Force forced the unit to change their name, as it did not pass the Air Force’s requirements for good taste. The Grim Reapers thus became the Ghost Riders. The origins and purpose of this patch remain obscure. The green figure holding the sword (or dagger) wears the cloak-and dagger garb often associated with black projects. There is a star in the northern hemisphere under the letter “S” and another red star in the American Southwest. The red star might refer to an operating location, but the patch provides no real clue as to where it might be. The Southwest is home to numerous classified units. Air Force Space Command in Colorado; Kirtland Air Force Base in New Mexico; White Sands, New Mexico; Groom Lake, Nevada; and the Tonopah Test Range are all possibilities, and there are many more. The words “A Lifetime of Silence” no doubt refer to the fact that members of this unit or project cannot speak about what they do. The image of a “Green Door” is also obscure. Military intelligence officers have a tradition of working behind locked green vault doors, but the symbol is widely used in popular culture to designate an inaccessible place. In Mary E. Wilkins-Freeman’s 1917 novel The Green Door, a young girl named Letitia longs to open a mysterious little green door in her house, but her aunt forbids it with the words “It is not best for you, my dear.” The 1956 hit song “Green Door” is about a man who couldn’t get into a party raging behind a green door. This patch is from the Phillips Laboratory Military Spaceplane Technology (MIST) Program Office at Kirtland Air Force Base in New Mexico. The original version of the patch sported an “X-Wing” fighter from the Star Wars movies. When lawyers representing George Lucas delivered the unit a cease and desist order, the aircraft on the patch was changed into the shape that appears on this patch. The Bird of Prey was a highly classified technology demonstrator that first flew at Groom Lake in 1996. Built by a secretive division of McDonnell Douglas (later acquired by Boeing) known as the “Phantom Works,” the aircraft was flown by Boeing pilots Rudy Haug and Joe Felock. Doug Benjamin of the secret Special Projects Flight Test Squadron was the only Air Force pilot to fly the aircraft. Although the shape of the plane was secret in 1996, the Bird of Prey patch contained an important clue. When Boeing declassified the Bird of Prey’s existence in 2002, it became obvious that the handle of the sword was essentially the same shape as the aircraft. This distinctive sword has since become incorporated into the symbolism of the Special Projects Flight Test Squadron. Familiar now is the 5 + 1 stars. Special equates to black, Red White and Blue streamers refer to the Janet planes. This patch is from the Operations Group at Groom Lake. The collection of five white stars and one purple star is a reference to Groom Lake’s nickname, “Area 51,” and here represents the Special Projects Flight Test Squadron. The color purple echoes the colors of the Special Projects Flight Test Squadron patch. The wrench and screwdriver are symbols for aircraft maintenance units and activities. There is also a red star in the bird’s eye, which may reference classified squadrons such as the “Red Hats” and “Red Eagles,” which were charged with flying purloined Soviet MiGs at the secret base. Green footprints on the cloud symbolize the “Ghost Squadron” search and rescue team. Lightning coming from the cloud spells out the letters “EW” for “electronic warfare” and represents EW test units and activities at the base. The red-and-white and blue-and-white streamers on either side of the bi rd reference the colors of the Janet planes. Interesting thing is that the green footprints also are tied to the US Air Force PJs. Mention the 1947 Roswell Incident, and one thing that always comes to mind is the 509th Bomb Wing that was stationed here in Roswell when the incident occurred. Their place in history was apparent in WWII, when they helped bring the war to an end by dropping the only atomic bombs ever used in wartime. Hopefully they will never be used again, but should that need arise, the 509th today stands ready to continue to defend our nation with the B-2 Stealth bomber, now located at Whiteman Air Force Base in Missouri. As in 1945 when they dropped the bombs, here in Roswell in 1947 when the Roswell Incident occurred, and continuing today, the 509th is an elite group. 60 years of military history is a long time. I’ve often wondered if that longevity is due to their involvement and secrecy in ending the Second World War and/or the Roswell Incident as both were events that did, and could have dramatic effects on the history of mankind. Is the 509th perhaps getting paid back for keeping secrets all those years? Many of us are aware of the secrecy that was maintained with the development, testing and use of the atomic bombs in the early and mid 1940s. Minotaur is a still-classified program undertaken by Lockheed Martin’s Advanced Development Programs division, the Skunk Works. Although Minotaur remains obscure, rumor holds that the airframe shares a “family resemblance” with another Skunk Works program called Minion and may have served as a technology demonstrator for that program. Does this pertain to The Minotaur missile program? A flaw with the new Minotaur 4 rocket has led to an indefinite delay for the debut blastoff from Vandenberg Air Force Base, military officials said. This is one of two patches known to be associated with a black Lockheed Martin Skunk Works project named “Prowler” or “Desert Prowler.” The project was active as of late 2005. The Desert Prowler is not an immediate relative of the Polecat technology demonstrator tested in 2006. The latter incorporated advanced aerodynamic and structural features for a future long-range, very high-altitude UAV, while Desert Prowler is more conservative. A photograph of the Beast of Kandahar, the classified stealth UAV first reported in April, has emerged on a blog linked to left-wing French newspaper Liberation. The photo confirms that the previous artists’ impressions were largely accurate. The jet has long, slender outer wings, spanning as much as 80 feet, mated to a stouter, deeper centerbody with a pointed nose. One important detail: the overwing fairings are not B-2-like inlets, but cover some kind of equipment – satcoms on one side, perhaps, and a sensor on the other. NOTE: The Three Vipers – The Three Blue Stars – The Eight White Stars – And the tail of the vipers wraps around the Earth.